Well, I was wrong about the move. Being a contractor I am usually out of the email and gossip loops and we won’t be moving until next Tuesday. So, what loops are your characters out of? Have they missed anything lately? How do they react? How much do they have to scramble? Keeping Secrets is always fun during a book. Heart Quest (coming soon to a bookstore near you), has the most mystery I’ve ever put in a book, and I had to do Clues. I’ve never really wanted to do a mystery for that very reason. Plotting. So if I do have a slight suspense-mystery bent where I don’t reveal the villains, I anticipate that my readers will ALWAYS guess EARLY who the villain is. I had a problem with the Clues. One of those things that I had to go back and put in. I prefer a clueless book. May you lay down everything necessary in your plot today. We are moving buildings today. When I was hired, I don’t think I was supposed to be part of this. I was to process old files for archival, then the (very small) department was supposed to move later in the year. The death of one of the supervising attorneys changed all that. The company wisely decided to get the department out of here as soon as possible. So we move today. I have, maybe, ½ box of personal stuff (calendars, coverflats, books, dishes). But I also have about 20 boxes of files I need to send off to the archives or designate for moving. I like this building better than the other, it’s closer to downtown and my bus. I don’t have much to say about writing today, except: How would your characters’ feel about moving? One basic definition of a story is: Someone leaves on a journey or a stranger comes to town. Which category does your story fall into? May today be smooth and not frantic for you. Most people are used to their bodies having a full range of motion. If a character doesn’t, this could definitely shade the story, especially emotionally. What happens when a vibrant person has an accident – child or adult? Can they resume health? If they do, won’t they remember the horror of the traumatic experience that stole their health, the pain, the therapy? When one of my cats developed diabetes, I had to put her in the hospital over the time of the Rocky Mountain Fiction Writers conference (coming up soon – September), and though I visited her every day, she was miserable. We learned to deal with 2ce daily shots, with insulin shock….I will never forget how, when she felt better, she tottered outside to lift her face and feel the air, the damp sprinkle of rain. And when I started writing, either my hero or heroine had scars (unpublished books). One heroine had been thrown during a riding accident and her leg hadn’t healed. One hero had lost an eye and a little finger and had leg damage after the battle for Ciudad Rodrigo. I thought then, and I think now, that these characters came to me that way because it was obvious that they’d experienced pain, experienced life, and might have an additional depth that others didn’t. So consider your characters health today, their mobility. I have a friend who I saw walking before me on the street a while back, and he held his body so stiffly that I was amazed. I didn’t think of him as impaired in any way, but something was definitely going on with his health. It's getting very autumn like here. I am cool when I write this and took down my sun blocking shade in my bedroom and the window fan. I'll start closing the windows at night. The days are getting shorter. I have a lamp that is supposed to help with seasonal disorder -- the lack of sunlight thing (but it was inexpensive so I don't know that it really works). I may have a mild case, but others can be deeply depressed by the lack of sunlight. And though I speak of retiring to Ireland, I've never been there and Denver has 300 days of sunshine. What would all that gray do to me? And my office faces south, which means that I should start getting sunlight about the Equinox, and the sun doesn't shine in during the hot days of summer, but is always a friend in the winter. So, what season is affecting your characters and how? Do they love the renewal of spring? Are they caught slogging through mud? Is the shortening winter days filling them with dread? Are they flying with a summer breeze? Exultant at the change of colors of the leaves and the brisk snap of air? Seasons affect us as people, and they should affect your characters, too. Use them. I'm late this morning, I've been in the groove with the sixth Luna synopsis and that is sufficiently rare that I wasn't going to come out of it for the blog. Naturally while I was writing the synopsis (well, the list of scenes/events) I thought of a scene I had to do NOW. And I couldn't resist writing the bones of the scene where J. (heroine, no telling of the name because that might give a secret away) meets the other Exotiques. In a bolt of lightning. If you've read my work, you know that's possible. Anyway, it's been a while since I've been in the zone, able to write fluidly and easily -- until yesterday. I've been having problems with the fourth Luna, thinking that I needed to show the loving family. When I revised the first chapter (and critique group approved of the new version) they told me to cut the father's birthday dinner. So I did. I would still like it in there, but it's probably better without. But it took me a long time to come up with the little scene in the first few pages which would take the place of two longer scenes that came after. I think I tucked a list in the back of my mind and let it simmer -- inner conflict of heroine, outer conflict, loving family, her special talent, the chimes and gongs and chants that mean Summoning is imminent. I had to let it ferment. Sometimes it won't always come together, but this time it did. Whew. A note on humor -- the scene I wrote this morning had an amusing bit. TO ME. Humor is subjective and what I might laugh at others might find stupid or silly. So the bit may come out. Janet Evanovich, who can write hysterical books, lost me in a couple of scenes which I thought Were Not Funny At All and were obviously Supposed To Be Funny. Others may have found them funny. So it's hard to write humor and strike the right note with everyone. If it flows from your fingers and makes you smile and laugh, great, but be open to the fact that you may need to cut it. Well, shoot, the bio thing was supposed to be for this am and got posted yesterday, too. The first chapter of my Luna books proposal was not received well by critique (taking the new version to critique today). So I stuck it in the back of my mind and let my subconsious work on it. I think I found an excellent fix and wrote it last night, fine tuned it this am. But I knew I didn't want to get bogged down in the old, problematic first chapter. Didn't want to open it up, half-heartedly tinker with it, then write the new scene. So I wrote the new scene on a new screen, in Times New Roman and single spaced instead of Courier New and double spaced. When it was DONE and polished I plugged it in. THEN I rearranged, cut, revised paragraphs. Wiped out the whole second scene. Because all my critiquers say that the minute we hit Lladrana, everything's fine. Getting there can be a problem. With this opening as with Sorceress because my heroine has a loving family (Marian had a loving brother and other family) and I had to set that up. The family part takes time. That's one of my tricks/techniques, just writing, then plugging in later. It keeps me from bogging down in too-many-times-revised words/scenes/chapters. I actially have a folder in my Marketing and Promotion folder named “All Bios.” And there’s anything from 400 word ones (wow!) to 20 word ones. The former I just revised for Luna Books to accompany ARCs of Protector of the Flight. The latter I revised earlier this year for the RMFW Conference Brochure. Yes, I usually update several every year, and, yes, they are targetted for different markets, so I vary the information -- awards, etc. Here’s the new Luna one. Robin D. Owens has been writing longer than she cares to recall. 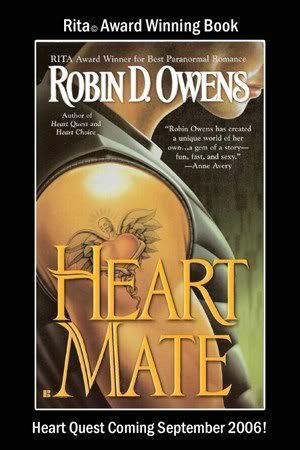 Her fantasy/futuristic romances finally found a home at Berkley with the issuance of HeartMate in December 2001. She credits the "telepathic cat with attitude" in selling that book. Currently, she has two domesticated cats and one feral, who is thinking about changing his mind on being Wild in the Colorado winter (canned food might also have something to do with this). She has secretly admitted to having as many as six cats. Before purchasing her home, she shared apartments with an innumerable parade of hamsters, and included one as a sidekick in her second Luna book, Sorceress of Faith. Naturally, for the flying horses in Protector of the Flight, she had to do hands on research with horses, and enjoyed every minute! She loves writing fantasy with romance or romance with fantasy, and particularly likes adding quirky characters for comic relief and leaving little threads dangling from book to book to see if readers pick up on them (usually, yes! Reader intelligence is awesome). Though she drinks tea, her most comfortable hangout to write is in the local coffee shop, and she dreams of the time when she will be a full-time author and can learn of all the great places to write in the metro Denver area. She is particularly proud of her web site, which includes such pages as Worlds (character interviews, cut scenes/chapters/characters, photos of places/things that have inspired her) and Free Your Artist (motivational quote, artist exercise, affirmation and fun links). Her web site is updated monthly and has excerpts of all her work. Her monthly contest is for fun items that usually tie into her books (jewelry, pet carriers, runes…). 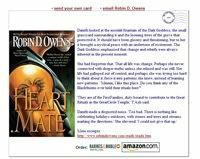 Robin loves hearing from readers, tries her best to respond to any questions and has been known to take reader advice for her work (the mole in Heart Thief…). Please email her at robin@robindowens.com. She is profoundly thankful to be recipient of the 2002 Romance Writers of America RITA Award (like the Oscar in her field) for HeartMate, the 2004 & 2005 PRISM Awards for Heart Thief and Heart Duel, the 2003 Denver Area Science Fiction Association Golden Lungfish Award for Writer of the Year and the 2004 Rocky Mountain Fiction Writers' Writer of the Year Award. I had lunch with a friend who was in critique group with me for many years yesterday. She left when she adopted a child and became a single Mom – and she was the one who had the idea that if someone really could find their HeartMate with a charmkey (like in Heart Duel, which she critiqued) they’d go door to door. Which was the basis of Heart Quest. I’ve been very tired lately and wanted to talk about her and her daughter, though naturally we caught up. SHE wanted to talk about the Heart books, and most particularly new titles for Heart Match. And what seminar I’m giving at RMFW (freewriting). This was so odd. But later I figured that the innate writer in her was still there, still clamboring to get out, that she missed writing and critique and everything else. Huh. Well, I did say I was tired. So, if you ever turn away from writing for other, greater priorities, know that it will probably live inside you always. My friend has an idea for a story, and I’d like to see it come to fruition. May you embrace your vocation today. OF COURSE there must be interesting food in your world. Or disgusting -- but definitely memorable. HeartMate had cocoa mousse and I got to continue that throughout the series -- beloved of FamCats, and probably the best line regarding it came from my friend armoire-man "Never eat anything bigger than your head." And, of course, mousse may be an exception. In Lladrana, Guardian of Honor, I had sweetcheese. Someone wrote me for the recipe. I looked around the web for brie in puff pastry with brown sugar and didn't find the exact recipe, but at least pointed her in the right direction. That really amused me. So, have you salivated during your reading? I have. May you bring taste into your scenes today. Master Documents (links of individual files) are easier to work with in Word Perfect than in Word (as usual). All my pantzer scenes go into chronological chapters, and when I finish the last chapter, I link all the chapters, expand, delete the subdivisions and there’s the book. Rough Draft 1. I probably tinker with Rough Draft 1 three or four times before it is Rough Draft Final. At times throughout the book, I may do master documents of what I have so far just to see how many pages I have, or correct something globally. So this blog is in the general topic of Keep Everything and Back Everything Up. I could have just cut what Didn’t Make Sense, but I wanted to know WHY things didn’t make sense, what I had before, if it needed to go back into the book. This time the answer was no. May you find everything you need smoothly today. Well, I think I told you all that Protector of the Flight came in at 590 ms pages. The edits were relatively clean. I cut about 8 lines and added (for clarification purposes) maybe ½ a page. I really didn’t have anything I sat to mull over or sit and think about, which was very good, and my editor didn’t ask for any major revisions, also VERY good. But, as usual, I did a lot of little clean up and word change. Which means that out of the 590 pages, about 570 are going back. Oh, and I changed the name of the flying horse. Yes, when you change a name, that means you SHOULD sit there and cross it out every time you use it, because the typesetter WILL miss one or two. I know this from personal experience. I actually changed 3 names, but only 1 had more than three refernces. It took me 20 hours broken into two 8 hour blocks and two 2 hour blocks. One of the 2 hour block was when I had to go back and check spelling, or something didn’t make sense, or the set up was wrong or I had to check my research – all the things I put little tabs by. So I got off easy this time and I’m grateful. May all your choreography work smoothly and the right names come to you today. I’m reading Protector of the Flight for copy edits and just got an advanced copy of Heart Quest and started reading it as my “bath book” (thanks to Nora Roberts and her Key of Knowledge for the various category of reads…) So, for Protector, I’m trying to make sure that what is in my head made it on the page. I noticed with a sigh some copy editing mistakes in Heart Quest, a misplaced comma that added confusion, two sets of possessives on one word. My only defense for this is that pages can get messy, marks that don’t mean anything can become letters, typos can be missed, a whole line can be deleted except for the last possessive. But there are Author Mistakes that bother me – Marrec’s last name in Guardian of Honor was Gardpont. In Sorceress of Faith, it was Guardpont (and at the beginning of the series it was Guardpoint). I’ve learned that, thankfully, many of these mistakes are ONLY seen by the author, and, though I don’t want to get sloppy, it is a relief. In Heart Thief I deleted a whole village during Holm’s and Tinne’s trek. That bothered me, but no one even knew there should have been four villages visited, not three. I still shudder at the mistake I made in Heart Duel, first describing a room (Marian was an interior designer, rehabbing a Residence for Straif) as having honey-colored panelling and then much later in the book it had plaster walls. No one’s said anything about that one, so I think it, too, slipped unnoticed. But perfectionsim can be a quality many of us possess. Get over it. Nothing will ever be perfect. Not the book that doesn’t QUITE match the vision in your mind, and certainly not the book on the shelf with the occassional blooper. I've always had a pretty good response to electronic postcards as promotion. At least with the postcard (with excerpts) being picked up by people on a list. I sent out two yesterday, mostly because the first didn't work and I wondered if yahoo's spam filters caught it. One was to the Futuristic, Fantasy, and Paranormal Chapter of the Romance Writers of America and included the interview I did with T'Ash about the tattoo on the cover reissue. Robin D. Owens stopped by Writerspace, and created a Postcard just for you! To pick up your card, simply click on the link listed below or cut and paste the web address into your browser. The card was created on August 18, 2006 at 17:48:43 EDT and will remain on the server for the next 30 days - so check it out soon! The card was created on August 19, 2006 at 15:44:59 EDT and will remain on the server for the next 30 days - so check it out soon! So far 73 people from the 2 groups (and Linnea Sinclair's fan base -- she forwarded it) have picked the card up. Yes, I have those sort of reviews, and the ones that really make me go "Duh?" which are those that say how wonderful my books are and give me 4 out of 5 stars. Shrug. As I've said before, inner validation is what matters. BUT, it's a different thing when the quote is going to be used on my front cover. Berkley wanted something that would address the body of my work, the series, and had a mediocre quote (and I'm trusting you folks to NOT remember the mediocre quote I'm putting here). "Readers will enjoy revisiting this fantasy-like world filled with paranormal talents." -- Booklist. Blah. So I scoured my reviews (which I usually keep around somewhere, I have a big document called For My Delectation where I kept all the "good bits" for HeartMate). I came up with a quote and sent it off to my editor. That was the first thing I checked as soon as I got 4 advance copies yesterday. Whew! It made it. "Robin D. Owens is an absolutely sensational storyteller." -- The Romance Reader. Ok, the source isn't as good as Booklist, but I thought that mattered less than the verbage of the quote. Some points to this post: 1) You have to be proactive in this business. 2) Quotes on the cover can be changed later than the art of the cover itself. May you nail a scene today that will bring you a fabulous quote. One more plug for the Tattered Cover event this evening. Not only will there be writers on a panel talking about writing, and Free Stuff, but there will be a lot of writers in the audience and a good time will be had by all. I guarantee it. So find yourself by the Tattered Cover and come see us! May your writing go well today, and if you need to talk to writing friends, do it! Rocky Mountain Fiction Writers is having their Writer of the Year panel tomorrow night at the Tattered Cover (new location in the old Lowebstein Theater). Carol Berg is our Writer of the Year (I was a couple of years ago) and we give away breakfasts and lunches with editors and agents and a free conference. So it's usually packed. One of the WONDERFUL thing about any writing conference is talking writing with others, people who GET it. Technique. Slow spots. Fears. Joys. I'll be doing a freewriting seminar (including, of course, freewriting) and we'll see how that goes. I've been getting my notes together, but at least it isn't the massive research job that "Software for Writers" was. What a hard one that was! And it wasn't picked up for RWA National (which is always my hope "try again next year" I heard -- well, software DOES change from year to year and I wasn't up for another couple of months of exploring the software and the $$). But freewriting will take less time and I hope be a benefit to all. If you're in the area and interested in writing, or the great Carol Berg, come to the event. May you feel like "Writer of the Year" when you sit down to your keyboard today. All right, will try and combine a couple of recent topics. Over the last 2 months, I've been to 2 funerals/memorial services. One was for a lesbian friend of mine, non denominational (though one of her good friends was a Christian priest so the general service was Christian), and the other for a colleague. There were a lot of colors and a basket of funky hats for people to wear at Janet's memorial, a low key space and food Brought By ALL. It also had some lead time to organize. Yesterday's service for Paul was a mostly corporate affair. Lots of suits and black (I wore a dark purple blouse because I look good in purple). People in the office worked very, very hard to pull this together within a few days. The casket was obvious. Some food was made by one of the attorneys, the rest was catered by Whole Foods. I suppose you'd call this different "class" rituals, or different milieus. One artistic, one business. So there's a great deal of variation in our American culture, consider that for your own writing. How much class structure? How much variation? I don't see almost any on Lladrana, and not much in variation on Celta. The basic ceremonies would be the same. Of course, it's easier to write a culture with no variation, or a world with clashing cultures that would handle rituals differently. The people were dressed differently, ate homemade v. catered food, looked differently, interacted differently -- the patterns of mingling and status were different. These are all things that you can use in your writing. May your next description of a social gathering be unique. I'm going to a funeral today, and as is often said, it is closure for the survivors. I do this out of respect for a man I knew only two months, because it is expected of me, and because I don't want to be alone in the office (though it is against company policy to let a contractor be alone in an office, and ironically enough, the only way I could stay on the Monday before July 4, was because the man whose funeral I'm going to was there with me). But many books have rituals and/or rites of passage. And if you write fantasy, you end up making your own. This falls under the Religion Worldbuilding category. I know some do huge amounts of world building before starting, but I knew I had a Celtic/pagan society in Celta, and a religion based on mysticism and Song in Lladrana. I don't think I've dealt with a funeral (or memorial service in the case of Lladrana since the fallen warriors sink into the planet Amee). Healing Circles I've done. Banishment. Disinheritance. Wedding. Coming-of-Age (Choosing a Baton -- twice, becoming a Scholar -- journeywoman in Amee Sorcerous Circles). I've referred to many off stage (now that I mention it, including a Celtan funeral). But I know, in general, what happens during my rituals, have enough underpining of world building that I don't have to research before writing a scene (though I have with Celta rituals). I've been to a memorial service this year, a non-denominational one for a gay friend. This one will be different. I'll be observing, because writers always do, but I actually think that will be low on my priority list. Time to get moving to get to work early so I can help prepare the "funeral meats." Oh, and that reminds me that people are VERY touchy about their rituals, how they are done, right or wrong. So two points -- think how your major rituals would be handled, they should come from the spiritual basis of your culture. Also, conflict could be initiated or aggravated because of a ritual. May your next ritual in your work fascinate. I know I've made up soundtracks for my work, and have them in files, and I've always listened to music when I work ... always have music on around me if at all possible. With all the ipods out there, we Americans LOVE our music. And my music is not necessarily the same as yours. That isn't the same as the Big, Big Writers having their work made into film, having a score, a soundtrack. This wasn't something I'd thought of before. Who would you get to score your work? Would you like it or not? What if a theme came out of a composer's head that you didn't care for? Or would always be associated with YOUR work? Those are questions to think about, but I think it would be utterly awesome, and I'm pretty sure that everyone else would, too. And I'd probably listen to the soundtracks until I was nauseated...and while I was writing my next. May a soundtrack roll through your head and help you write today. I'm working on Heart Match (title to change), and realized that one of the scenes that "starts in the middle" (since I'm a pantzer) is the First Meet, which, in romance terms, is the first meeting of the hero and heroine. This usually sets up sexual tension, romantic tension, interaction, and may also highlight their differences which will lead to the Black Moment where the relationship breaks. So it's incredibly important. I wrote the scene, but am dissatisfied with it. It's in the hero's POV, so he doesn't know (but the reader does) that the heroine has a Big Secret. So now I'm thinking that I should be in the heroine's (Dufleur's) POV. But I've been in her POV for the last chapter and a half. Huh. I think I'll take a look at it, revise once and go on, then come back if there's something I need to set up in the end. That's usually THE best thing to do with any scene. **s to the rescue, reminding me that I must revise the scene (as if I'll forget). But if you're writing romance, note the above list that CAN be accomplished in this one scene -- the interaction between the hero and heroine. Even with a romantic subplot, this should be a well-crafted scene. I just got the line edits for Protector of the Flight. Since I hadn't heard that the book had been formally "accepted," and, as you know if you've been reading, I was nervous about the book, this is a great relief. Furthermore, I think I have longer to look at the thing than any of my other books. Almost 20 days! Wow. So, I'm happy. I definitely have to review the edits my horsewomen went through on and revise there, but otherwise it looks clean. I'll give it a good read, too. May today bring you no revisions. I can’t stress this strongly enough. Find people whose writing you like at any point in their career (newbie to multi-published) and make friends with them. Be sincere. I have written cover quotes for people after reading their work – people in RMFW, people I’ve met online, people who’ve bid high when I auction a critique for a good cause. I’ve recommended critique buddies (and other writers) to my editors and agent. COURSE I’m not the only one. Most writers I know would lend a helping hand to others, no matter where they are in their career. And I’ve been the recipient of generosity, Deb Stover and Anne Avery (local ladies at the time) read HeartMate and gave me cover quotes. Jayne Ann Krentz (may she be a bestseller on the New York Times forever!) gave me a quote for Heart Thief. Linnea Sinclair, when I was desperate for layout for an ad for Heart Duel DUE THAT DAY to Romantic Times (my designer fell through at the last moment), spent an entire day working on MY ad, and I’m pretty sure she didn’t do much else. May friendship grace your pages today. Fiction can often be LESS than real life. And in novels, we usually start just a little (ordinary world) before the life-changing event or decision of the protagonist. Another thing to consider is that when a huge event happens to your main character, it DOES have a ripple effect all the way down to spear-carriers (characters mentioned once). I was at the day job an hour yesterday when we learned of the death of one of the people on the floor (there were 12 of us, including me and him). Lives change instantly. The person I work for was his main support person. I'd known his paralegal for seven years. I knew the guy for about two months, and OF him for seveal years. He was a nice guy, a decent man. He went home with a sore throat last Friday. And died Tuesday night. I am pretty sure my spear-carrier job is going to change. I am here to do what needs done. May you take joy from your life today. May you cherish your family and your life and creativity today. During the long, many revisions of Heart Thief (the book was a romance, then fantasy, then romance again), I surprised my critique group with the fact that the remaining spaceship, Nuada’s Sword, was in Druida City. I, of course, knew this. It was a big issue in the book, that Ruis would be executed if discovered to be IN THE CITY. For some reason, when the time came when Ruis was caught and taken away, ALL of my critque group thought the Ship was OUTSIDE the city. (This whole thing became our key phrase for setting/choreography mistakes, The Ship Is In The City). So I wrote and rewrote the scene early in the book where Ruis slips back INTO the city to make it clear to the reader where the Ship was located. I went back and probably reminded the reader too many times that The Ship Was In The City. Since then I think I’ve described the location of the Ship in every one of the Heart books. Hey, it’s THE landmark. A twenty story, two mile Ship would dominate a low tech world’s landscape. I am still sensitive to its location. When I first announced that I was laid off last year on one of my loops and asked if they thought I could make a go of a writing career, the major discussion was about the cost of health insurance. That topic cycles around every year on my writers' loops, mostly for those of us looking for reasonable plans. Full time writers are usually self-employed, and if single, like I am, aren't on anybody's insurance plan. As a contractor I never had health insurance provided for me. I went without for a long time, about 7 years, then got "the feeling" that I wouldn't beat the odds for much more (I did have a very bad ankle sprain during that time that I had nothing done for). I pay my own health insurance. I did have some medical problems, most notably last year when I landed in the ER for a day because I picked up a virus which gave me vertigo. I never thought vertigo was a big deal. Before. When you can't walk 15 steps without throwing up, vertigo is a very big deal. An outbreak of whatever this virus was zinged around Denver last year. There were 3 of us in the ER that February day with it. I am still making monthly payments on my part of the bill, and I think the hearing in my right ear was damaged. It's tough out there without health insurance, and that really IS a big question about quitting the day job (or quitting or transferring any job, I know). So before you become a full time writer, this is definitely one aspect you MUST consider. The above website is a contribution site set up for members of the writing community who need help, mostly those with health problems. May no worries about health insurance darken your writing day today. Fashion can be a big deal -- how your people dress tells you what they do in life. Can they afford haute coutier? Would they want it? How do they dress when they most want to be comfortable (I think telling you what I have on now would be TMI). Do they dress the way they do because they have ulterior motives (a vice cop going undercover as a street walker). Or because they were ingrained by thier family or expected to dress the same way by their friends. Fashion is the ultimate peer pressure. In fantasy, we might not spend a lot of time on fashion -- he wore the baggy, rough garments of a farmer. But I've been thinking a lot about it. The world of Celta has a Regency undertone, probably because I read a lot of them. I have been accused of not being able to write a contemporary book because my tone is too historical. Maybe. We'll see if I can pull off that Urban Fantasy. In any case, Dufleur Thyme is facing The Social Season (you don't say "no" to GreatLady Holly, and SHE has an agenda (and it wasn't a surprise when I wrote the pages to see that she did. It was something I didn't know about, but not a surprise). So I've been thinking about what the elegant and fashionable wear during the Social Season on Celta a couple of hundred years after colonization. I've always emphasized the difference between commoner and noble clothing, the fabric, the wideness of legs and sleeves. I'm thinking that this year, the men are wearing turkish trousers, those that bag and are gathered at the ankle. Robes are IN. So it's a topic that you should consider in your writing. Having bad hair days happen to many people and it's an irritation that can set your characters' nerves on end from the moment they wake up. May your costuming be interesing today. As I was walking around yesterday near Cherry Creek Mall (THE upscale mall in Denver, which I hadn't been to in a year and a half), I met Mario Acevado (The Nymphos of Rocky Flats) and he said there should be a seminar about After Publication (well, there were lots at RWA, but I didn't say that), how people's expectations were that after they published, everything got easier. Ha, ha, ha, ha, ha. I don't know whose he's been talking with (we run in different critique group circles), but he IS right. It gets a lot tougher after publication. Mario said that OTHER'S expectations (publishers, agents, editors) of you and your work become higher for you. Which is true, too. I think it was Heinlein who said that when he started out his writing career, he could write 3 books and only 1 of them had to be good. As time progressed, EVERY book had to be good. Maybe because tv and film have lured people away from reading -- but, on the other hand, there's not much allowance for "failure" there, either. I think it might be the immediate gratification issue in our society. Things should be good and available. And easy to do. Most books are not easy. And if they must be good and quickly available, most authors scramble hard to keep up the quality and the pace. May your writing be quick, painless and EXCELLENT today. I just got back from the grocery store. The cats have been out of cat food since Tuesday morning. They've subsisted on tuna and chicken. I was running out of food myself. Anyway, while I was there I picked up a Sherrilyn Kenyon BAD book (I figured out this was a series), about an assassin. I've just finished Linda Howard's Cover of Night (and she missed some logical payoffs which irritated me) and it had 3 assissins and two Marine tough guys who have killed in it. One of the assassins seems to be the hero of her next book if the end set-up is anything to go by. And, BTW, I LO000VED Howard's Kiss Me While I Sleep with a heroine assassin. Anyway, I picked up the book and read the back cover copy, hesitated, decided I was still in the mood for assassins and I trusted Sherrilyn not to do typical dumb things with heroes/heroines on a spy mission and to tell me a good story. Then I thought of this blog. The WORST thing that can happen to me at a signing (and this will happen next month at the RMFW signing, I guarantee it), is for someone to come, pick up my book read the back cover copy, smile and put it down again and walk off. I HATE this. I KNOW I write romance or sf or fantasy that folks might not like, separately or mixed, and I'm not saying you don't have a right to check my book out, but DA*N it's difficult to sit there and feel rejected and pretend you don't care. Light bulb going off -- I think I've been silent and courteously let people read. That may be a mistake. Better if I do a personal blurb/pitch "It's about an average American woman Summoned to another dimension to fight invading evil" and then tag on whatever applies to Alexa or Marian. After all, if I'm going to be rejected, I may as well be rejected for the back cover copy AND the pitch, huh? Well, it's DEFINITELY time I go get that flat tire (been running around on a donut) fixed. Such a glamourous life. May your writing be definitive today. Take a body check today. How are your wrists? Check for carpal tunnel or tendonitis. What about your lower back? Your neck? Your shoulders? Are you stretching? Excercising? If you binge write, you might consider taking a break every hour or so … and should at least every two hours. Walking and excercising can bring ideas – or the opposite – turn off the brain and concentrate on the movement, on the slide of muscle and tendon. Maybe you want to recall how you feel so you can describe it later. Listen to your body. Can you hear your heart? Feel your pulse? Remember and use this in your writing? May body and mind work together for you in your writing today. ONLINE CHATS GIVE YOU REAL TIME TO INTERACT WITH READERS, AND YOU SHOULD DEVELOP YOUR OWN VOICE FOR THIS, LIKE WRITING. So if you have questions about HeartMate, What Dreams May Come, me, my work, Writing and Publishing, come visit HERE! And yes, I will be up next month for Heart Quest and will try and remember to give you a day's warning on that one. I'm still getting myself together from RWA conference, cat stuff, Mom's cataract surgery on Tuesday (I spent the night) and day job changes. May you be able to totally focus on your writing today. An interview with T'Ash about the tattoo is on my amazon plog. I love this book. And I love the cover. If you think you might enjoy my work (or have enjoyed my other books, but haven't gotten this one), please buy. May your writing dreams make you smile today. I feel this is very important, and I usually do it every month – it may not go up during the first week, but it WILL be updated. The pages I ALWAYS update are: Home and Bookshelf and Free Your Artist and Worlds (with my Contest info. My contest usually has something with regard to the latest book out, in August it will be the Rohrig Tarot, the most sensual tarot I have and the one which I based the deck my heroine uses on). The Free Your Artist takes most of my time. I scour the web for a good quote on creativity that might match my topic, write creativity excercises and an affirmation. I’m not quite sure how many people visit this page every month (I used to be a demon for stats, but not since I switched my servers last year and the stat program). Still, Free Your Artist is my “give back” to the web community. So is Worlds. Worlds is where I put pics that inspire me (of the Residences on Celta), include cut scenes, and do character interviews. This month I’ll have a continuation of the character interview of T’Ash, focusing on the tattoo on his arm – new for the Reissue of HeartMate. About Me gets changed the least, including the contests I’ve placed in or won. May you stick to your writing today.